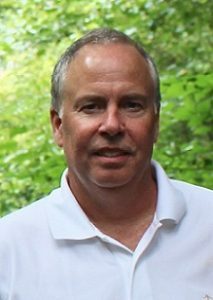 Author and illustrator Richard Torrey shares his thoughts on the role of libraries and his process creating Ally-Saurus & the Very Bossy Monster. 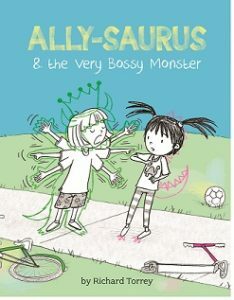 How would you describe your book ALLY-SAURUS & the Very Bossy Monster to children’s librarians sharing this book with young readers? Like the first book (ALLY-SAURUS & the First Day of School), it’s primarily a celebration of the incredible resilience and flexibility of children’s imagination. In this story, Ally-saurus and her friends are having a wonderful time playing pretend, each in their own way. But everything changes when the bossy new neighbor, Maddie, shows up. Maddie insists they play what she wants to play-and according to her rules. When she finally goes too far, Ally-saurus ROARS into action, helping Maddie understand that bossiness is no fun at all. What inspired you to tackle the issue of bossiness in this book? I never intentionally set out to tackle specific issues when I write a story. I actually believe it’s the subconscious serving up important ideas to insert into the early drafts, which, in many cases make the story. Sometimes I’m not even aware that I have touched on something important or profound until rereading my previous days work. I love that about writing. I think the experience of being bossed around is one that is universal-especially early in life. Every child has found themselves in situations like Ally, Kai, and Petey, where someone attempts to walk all over them (try growing up in a family with four brothers!). The difficulty I found writing ALLY-SAURUS & the Very Bossy Monster was how to portray a response to Maddie’s bossiness that was neither unrealistically passive nor alarmingly over the top. It was also imperative that the response felt authentic for Ally-saurus’s character. Did you love dinosaurs as much as Ally did as a child? 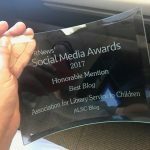 How can children’s librarians best support young patrons’ interests with exploring various topics? I loved dinosaurs as a child-especially drawing them. 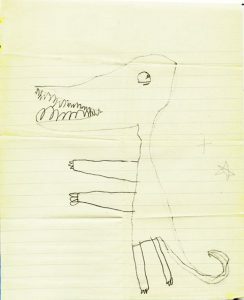 Recently my mother sent me a picture of a T-rex I drew when I was three. It’s not bad, though his teeth look like he needs braces. One of the best ways a librarian can foster a child’s curiosity is by educating them on all a library has to offer. A child familiar with that library’s resources and the ability to do a search has the world at their fingertips! Some young children can struggle with being assertive in various situations. Why was it important for Ally to address her issues independently without turning to an adult with her concerns? The whole point was to show that Ally-or any child-has it within them to stand up for themselves. In both Ally-saurus stories Ally uses her imagination to help her deal with real life issues. That idea originally came from watching my son, who was much smaller than other children his age. He used to pretend he was a big strong dog, constantly describing what he looked like down to the last detail. It finally dawned on me that he used his dog persona to give himself courage when he was feeling too small. Likewise, Ally’s dinosaur persona helps her when she’s in need of a little courage. Libraries provide safe spaces for many children in their communities. How can librarians help children like Ally when they deal with difficult experiences? In my book, Ally finds the courage to stand up for herself by standing up for her friends. There is something comforting as well as empowering in knowing you are not alone in your struggle. With all the wonderful resources at their fingertips, librarians can assist a child in finding stories with characters who might be dealing with problems similar to their own. Helping that child to discover (through reading) that others have gone through the same experience brings that same comfort and empowerment, and may even provide practical solutions. How can picture books best tackle complicated topics for a young audience, and what should librarians’ role be in those conversations? That’s a tough one. As I said earlier, I don’t intentionally set out to tackle complicated issues when I write. I also know, as a general rule, editors counsel writers to avoid being too didactic. So I suppose the best way for a picture book to deal with difficult topics is to do it with a very light touch. I also think including humor, when appropriate, always helps. As far as the librarians’ role, I would think it begins and ends with being an approachable, willing listener. Creativity is highly valued as the characters explore through imaginative play. 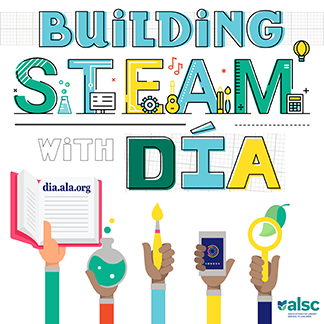 How can children’s librarians encourage creativity among their youngest patrons? Having spent my entire adult life using it to make a living-I’m a big proponent of fostering creativity and have done numerous talks on the subject. Creativity blossoms in quiet environments, free of distraction. It becomes harder every day to find such places in a world filled with smart phones, computers and video games. The library remains that enduring oasis of calm. By encouraging children to quietly sit and allow themselves to become engrossed in a book, a librarian is fostering the same behavior needed to reach that creative state. It is a learned skill, sorely lacking today. Color outlines emphasize the characters’ behaviors and emotions through these illustrations. What is your favorite visual aspect of this book? In my story, Ally and her friends must contend with a rather bossy new girl named Maddie. Maddie insists that Ally and friends play monsters with her. As with Ally’s dino-persona, I illustrate Maddie’s imaginary monster persona using a crayon line around her image. I haven’t told anyone this yet, but I secretly designed Maddie’s monster persona to pay tribute to Maurice Sendak, and his masterpiece, Where the Wild Things Are. 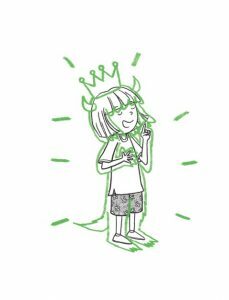 Maddie’s monster has some of the combined characteristics of Sendak’s wild things, including horns, and is topped off with a crown like the one Max wore as king of the wild things. What role did libraries play in your childhood? I grew up in a crazy household, with four brothers. From the time I was six, one of my favorite refuges was the library! As I said earlier, it was that enduring oasis of calm, and there was always something new to discover and read. To this day, it’s one of my favorite places to spend time. What future adventures are next for Ally? What other projects are you working on at this time? I haven’t come up with the next Ally adventure-yet. When I’m done promoting this book, as I did after promoting the first Ally-saurus, I’ll head to the quiet, distraction-free environment of my studio, and wait for it to come. And it will. I’m also working on three other stories, including a follow up to the award winning, My Dog, Bob (Holiday House). Great descriptive journey through Ally and the story line. Of course being your Mom I think you’re brilliant. What an author!!!!! What a thoughtful fun interview with Richard Torrey. His work is remarkable and I can’t believe he drew that T-Rex when he was only three! Wow, he sure showed talent at a very young age.